… or, That’ll Teach Me To Go On Vacation…. This past week was noteworthy for being the first time in a loooong time that I bought more Marvel than DC books. Considering I’m not participating in the Civil War hubbub, that’s saying something. Accordingly, let’s begin with a couple of books that expose my ignorance of Marvel Universe minutiae, Agents of Atlas #s 1 and 2 (written by Jeff Parker, pencilled by Leonard Kirk, inked by Kris Justice), and Beyond! #3 (written by Dwayne McDuffie, drawn by Scott Kolins). For AoA, I remember Jimmy Woo pretty much only from Marvel’s Godzilla book, and outside of Marvel Boy having his own Grant Morrison miniseries which, you guessed it, I never read, I hardly recognize any of these other characters. (Except for Dum Dum, but everybody knows him.) I’m intrigued by these issues, if only for the notion of Z-list characters somehow coming together into a formidable fighting force. I get the feeling that this is the attitude to which the Shadowpact aspires, but I like this book a lot more. Also, I’ve been a fan of Leonard Kirk’s since his days on DC’s Star Trek books. I continue to enjoy Beyond! despite (again) no knowledge of Deathlok beyond the recent Dave Campbell profile. As far as the plot itself, I was a little disappointed by the big reveal at the end, and probably not as stunned as I would have been had I known who that Dobby-looking creature was. Come to think of it, She-Hulk #11 (written by Dan Slott, pencilled by Rick Burchett, inked by Cliff Rathburn) falls into this category too. I was heartbroken by the “fate” of Awesome Andy (he came and he gave without taking), and I always like Rick Burchett, but once things started flashing back to Man-Wolf’s weird alien connection, the little “? ?” balloons started popping up overhead. Is this how DC newbies feel all the time? Boy, I never knew you had it so bad…. And while we’re on the “it was good, but I’m too stupid” theme, don’t hold your breath waiting for me to extract deep profundities out of Solo #12 (by Brendan McCarthy et al.). I think I appreciated what he was trying to do, but I’ll be dipped if I can tell you how he did it, or much about what it was. Everybody loved All-Star Superman #5 (written by Grant Morrison, drawn by Frank Quitely) and I did too, so if you’re not buying it, or waiting for the Absolute edition, or whatever, I don’t care — you shouldn’t deny yourself any longer. Maybe the best part of the fine Summer Of Superman ’06 is the rejuvenation of the regular books, at least as long as Kurt Busiek has anything to do with them. Action Comics #842 (written by Busiek and Fabien Nicieza, drawn by Pete Woods) presents Part 2 of the Manga Kha — er, Auctioneer storyline, with Supes assembling a rag-tag bunch of misfits, plus Nightwing and Firestorm, to bring him down. I’m not as excited about the prospect of Richard Donner and Geoff Johns as the regular Action writers, because while they’ll certainly bring the big events, I doubt they’ll do it with as much wit and style as Busiek. To be fair, Busiek and Johns collaborated on the excellent “Up, Up And Away!,” so I suppose the burden is on Johns to prove he wasn’t riding Busiek’s coattails. End of digression. Mark Verheiden writes and Ethan Van Sciver draws Superman/Batman #29, Part 2 of a storyline which finds our heroes up against a shape-changing menace that tends to copy their friends. Green Lantern shows up too, which is a plus, although I got the feeling I was supposed to recognize the big pink bad guy. What is this, Beyond!? Anyway, Verheiden’s story has been tighter so far than Jeph Loeb’s epics, but he tends to rely on the kind of overheated exposition I thought Loeb would have taken with him. JLA Classified #26 (written by Howard Chaykin, pencilled by Killian Plunkett, inked by Tom Nguyen) begins a new arc that finds the League embroiled in global politics, and didn’t we just go through this with Gail Simone a few issues ago? I’m only kidding a little — the plot is sufficiently different, focused more on the League’s keeping a low profile, and it reads enough like Chaykin and enough like the JLA to make me, a fan of both, happy. Nguyen inked much of the Joe Kelly run on JLA, and Kelly did some political storylines, so that adds to the familiarity. 1602: Fantastick Four #1 (written by Peter David, pencilled by Pascal Alixe, inked by Livesay) will probably turn out to be pretty inconsequential, but for now it’s kind of goofy fun. The Frightful Four are the villains, and a Doombot and some vulture-men show up too. A bit of initial misdirection works, but a later bit doesn’t. There’s a somewhat oblique reference to Ben Grimm’s Blackbeard impersonation as well. Art reminded me of Keith Giffen circa 1990, and for the most part it was good, although I had trouble trying to figure out if a couple of minor characters were supposed to remind me of familiar Marvel folk. I think David’s sense of humor is well-suited for this, so I’ll give it a chance. 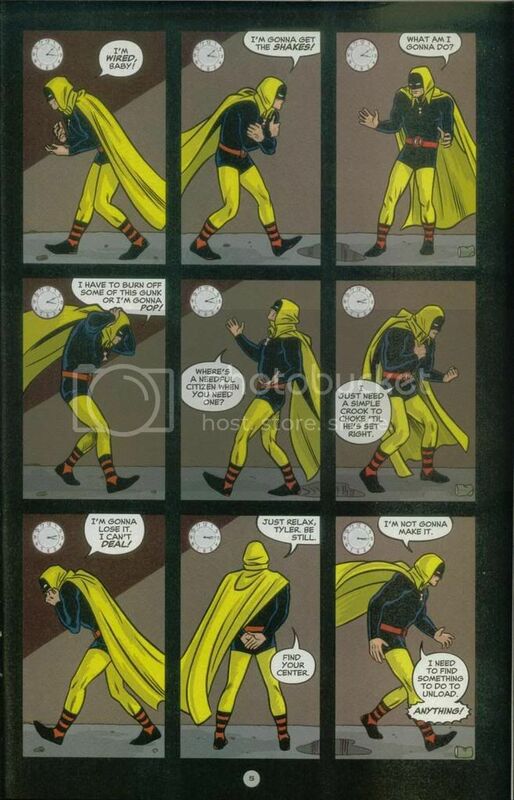 Giffen himself is on display, of course, in Hero Squared #3 (plotted by Giffen, scripted by J.M. DeMatteis, drawn by Joe Abraham), another well-made issue that begins with a classic-Marvel parody and features an embarrassing fight between Milo and Valor at the funeral of the man Valor couldn’t save in #1 (or was it last issue? can’t remember). Abraham reminds me more and more of a cross between Kevin Maguire and Bart Sears, and given how Giffen and DeMatteis honed their comedy schtick, I wonder if that’s an accident. Looking forward to #4, which promises more hitting, although I don’t mind all the dialogue. Detective Comics #823 (written by Paul Dini, pencilled by Joe Benitez, inked by Victor Llamas) presents a good, somewhat creepy, Poison Ivy story that positions itself as a fair-play mystery but really isn’t. However, the twist is right out of an old EC horror book, or maybe a “Twilight Zone,” and aside from my secret-identity-alert! radar going off whenever there’s a fight in the Batcave, it was handled pretty well. Benitez and Llamas do a fine job with the art, which is somewhat in the Image thin-line cheesecake style (at least as far as Ivy is concerned) and still manages to make Batman look imposing and Robin look like a kid. The best part of The (All-New) Atom #3 (written by Gail Simone, pencilled by John Byrne, inked by Trevor Scott) was, as many others have noted, the “Sanity roll!” exclamation. Not that this hasn’t been a fun book all along; and here it veers into the same kind of creepy territory as that Detective story. However, the presence of the big supervillain here makes me wonder about her timeline, given her prominence in another book’s current storyline. I can’t decide whether I like her better here or there, and I say that despite her being, shall we say, clothed in something less than unstable molecules. Finally, we have 52 #s 17 and 18 (written by Jay, Barry, Wally, and Bart, breakdowns by Keith Giffen, pencilled by Chris Batista and Eddy Barrows, inked by Ruy Jose & Jack Jadson and Rob Stull). I still say reading this series is like keeping up with Time or Newsweek — every issue is an infodump, and occasionally you get a fairly cohesive issue like #18 that focuses almost entirely on one story. Therefore, I liked #18 better, but maybe that’s because it feels more like a “regular” comic. Also, #18 addresses the concerns I had about Montoya’s actions at the royal wedding, which was nice.